Notes: Based on the video game / card collectible game phenomenon. Ash Ketchum is a 10-year-old-boy who has just come into his right as a Pokemon trainer. Kindly Professor Oak gives Ash his first Pokemon: a yellow fuzzball named Pikachu. 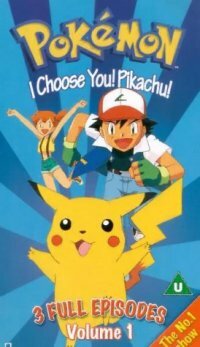 Ash sets out with Pikachu in tow to find adventures and even more Pokemon in his quest to become the Pokemon Master. If you don't know about this series by now, you are either deceased, or have -really- good selective memory. For those of the latter persuasion (because the former, well, can't be helped unless you're, say, Mosquiton or Miyu), Pokemon is quite simply a runaway phenomenon that is currently worldwide. A triumph of Japanese cute. This series has fans on both sides of the Pacific, and after sitting down to admittedly a LOT of episodes of Pokemon, I can see why it's so popular. It really -is- a good show! Not groundbreaking by any means - Vision of Escaflowne it's not. But it's an enjoyable show with funny characters, especially the so-called villains, Team Rocket, who are an absolute hoot (and ironically the subject of more Internet debates of "Will they? Won't they?" than either Lois and Clark or Scully and Mulder could ever dream of having). And yes, Pikachu *is* cute. But it's more than cute: Pikachu actually has a personality. It doesn't like everybody, as it pretty much starts out hating Ash, but Pikachu becomes quite a diplomat later on. Pikachu and Ash share a bond akin to Lassie and Jimmy, which can sometimes seem more than a bit contrived. Pikaaa!!! What's that, Pikachu? Brock and Misty are trapped in a ravine? Pika! And Team Rocket is holding their Pokemon hostage? Pikapikapikapikapikapikapika. You're right, let's go! Pika-piiii! For all its faults, which surprisingly are few, Pokemon is an enjoyable, unapologetic kids show, at least early on. There's still a lot here for adults to enjoy, and it warms my heart to see Pokemon showings crammed full of six-to-ten-year-olds who think this is the greatest thing they'd ever seen ... it brings back memories of when I was a kid, and I would wake up early just to watch Robotech and Voltron, which were just as dear to me. And it -is- one of the better shows on television for children right now. It doesn't insult their intelligence, but it's not too adult either. Plus the in-jokes to other anime series in early episodes of this show, specifically Revolutionary Girl Utena, make it a treat for anime otaku as well. Unfortunately, by season three, Pokemon had gone as far as it could go, so Nintendo went the Dragon Ball Z route: milk it as far as they can. While Pokemon Advanced Generation is technically considered a separate series (thereby officially ending the first Pokemon series at episode 276), it's obvious that they're just beating a dead horse, running the same story over and over again. That's too bad. Recommended Audience: Three and up. Nothing objectionable in either Japanese or English. It's a family show, pure and simple. Television rating given is Y7, but it's really just as fine for most under-sevens as well.